No alien invasion is complete without the Kids Complete Alien Costume. You think those puny earthlings are going to take you to their leader if you look like a shnook? Of course not. That's why you need this costume. Expand your galactic empire with style and grace. Click on the image for more information and to buy this costume from our affiliate partner. Add another layer of horror to your haunted scene with this alien, about! 37 inches tall. Plastic skull. Green. Movable parts. String attached for easy display. The fear of aliens and the unknown is just perfect for haunted house owners. We haunted house and home haunters can seize this fear in our neighbors and customers and bring it to the front of their minds. 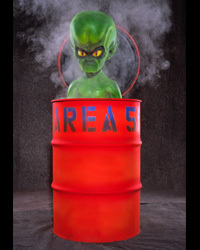 If you own a haunted house or set up a home haunt, you need to work in aliens. I'm not talking about cute E.T. 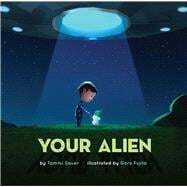 I am talking about the aliens from the nightmares of abduction victims. 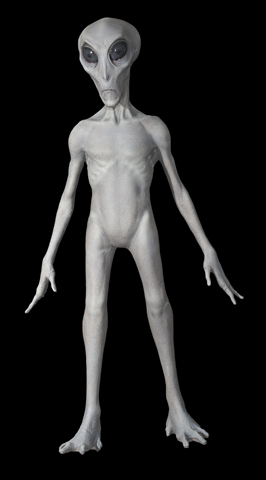 A major reason people fear aliens is the fact they are a mystery. People are afraid of the unknown: death, sickness, a new boss, etc. I encourage you to try creating an alien autopsy room. You will love the screams you get! 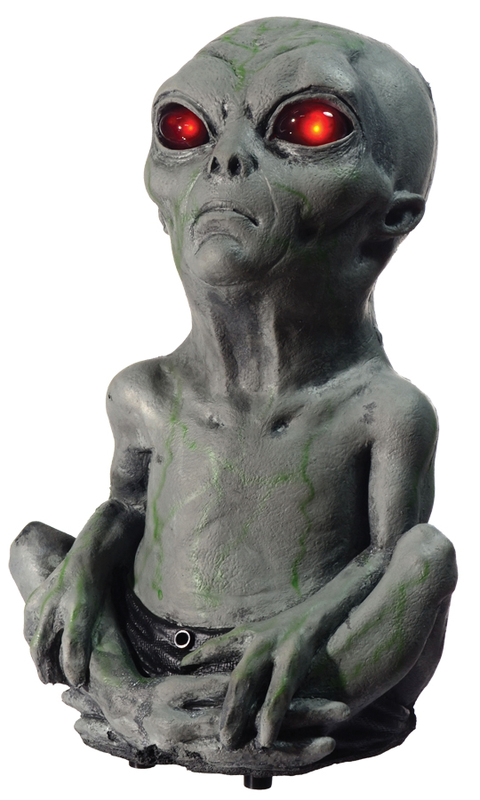 We present on this page some of our own alien props, alien figures and excellent DVDs from our affiliate partners. Click on DVDs for ordering information. 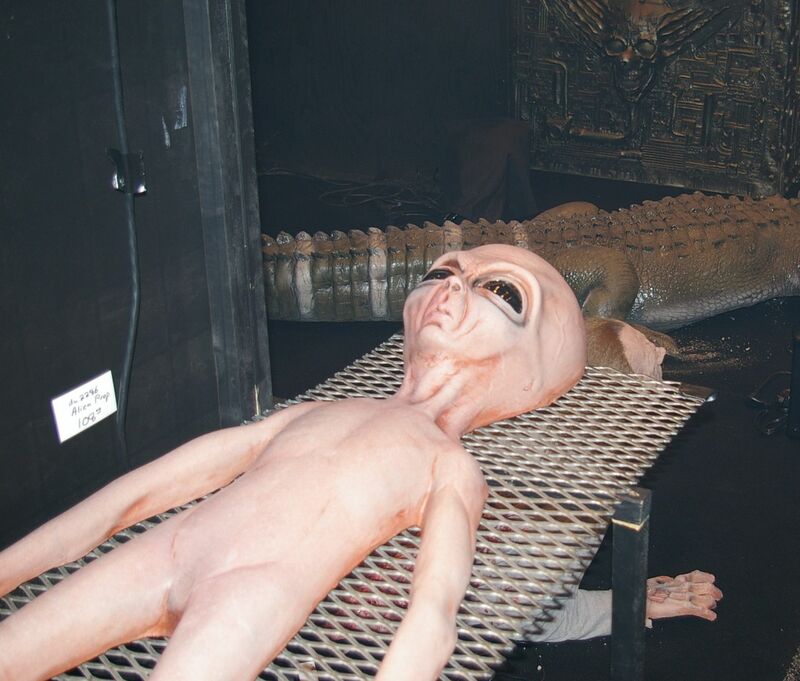 We love our alien prop and guests to your haunted house will, too. This foam-filled, flat-backed latex piece is precision painted to achieve a realistic look. Approx. 4 1/2 feet tall. The back of the alien prop is flat; front of the alien is latex and filled with a poured foam which is molded flat on the back. Free shipping in the continental United States for this awesome prop! Past Feedback: "Very realistic. So ugly I screamed when I took it out of the box! Hubby loves it." Get two of our aliens at a discount! This is a great deal we may not offer forever. 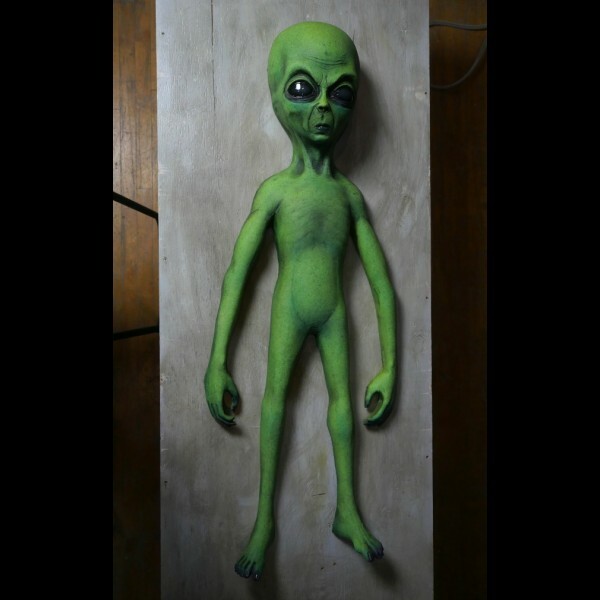 NEW - This UFO Alien was sculpted by artist Jordu Schell -- Beautiful, full-body creation perfect for a haunt with an alien theme! Foam-filled latex body with armature and stand. E-mail us and we can work up the best shipping cost for you! Foam-filled latex Alien Baby 'spits' at its admirers. Squirt bottle is in baby's back and is very easy to operate. Squirt bottle and blanket included (blanket color may vary). This awesome alien pops up with the throw of a switch or optional pressure pad / motion detector. Includes fog machine, tape player, tape and amp. Requires 100 psi air compressor. 3-D UV EFX. This prop ships freight. Just for our customers, we have already included the freight shipping and crating charges! 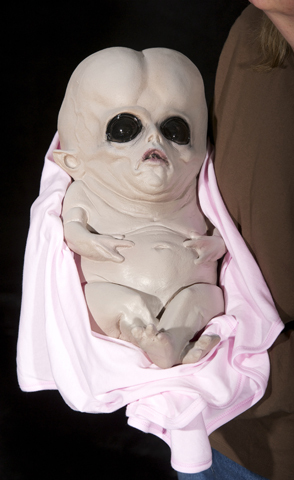 We are happy to present this new alien prop. Green Alien: Your friend will be green with envy just like this Alien. Foam filled latex flat backed prop. Highly detailed and expertly painted. Made in the USA. It is approx. 60 inches tall. Legs will be folded for shipping. This space man is perfect for a haunted house or home haunt. We recommend this prop! Scare your guests with this alien specimen. No laboratory is complete without these specimen jars. Bubbling and flashing lights enhance the eerie setting. Resin base and rubber top included. The incubators are approx. 22" tall by 11" x 11" base. They are custom made at time of order and take roughly 3 weeks to build.